These books are about a princess well loved by her parents and countrymen. As princesses go, she isn’t especially pretty and her kingdom is not especially rich or large, but Princess Mabelrose is pure of heart. She makes friends everywhere she goes, learning anything that anyone will teach her. One day Mabelrose is captured by a dragon as an addition to his hoard. She learns that no one, prince or wizard, has yet to survive a rescue attempt on any of his previous captive princesses. So Mabelrose decides that if no one can get to the castle then she will just have to meet them half-way. Mabelrose proceeds to fool the dragon, steal some of his hoard, and escape the castle. This, of course, angers the dragon as he must recover his hoard. Along the way Mabelrose meets a talking porcupine named Spikey who accompanies her on her adventures. The princess’ actions send her upon all sorts of adventures as she tries to make her way back home. 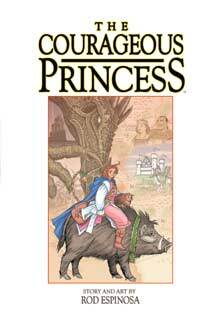 The Courageous Princess is suitable for young readers, especially girls. The storyline is a bit simplistic, but a better alternative than many of the Disney princesses. For those that know their fairy tales, many are mentioned in oblique ways. The artwork is nicely drawn but also a bit cartoony. This is a set of books that I’ll be forwarding to a certain princess-loving girl I know.